Please note optional attachments are brought in to order from Honda. Even small gardens can present a challenge for soil cultivation, with flowerbeds, vegetable gardens and ground to be prepared for grass seeding all requiring considerable physical effort to ensure perfect growing conditions. 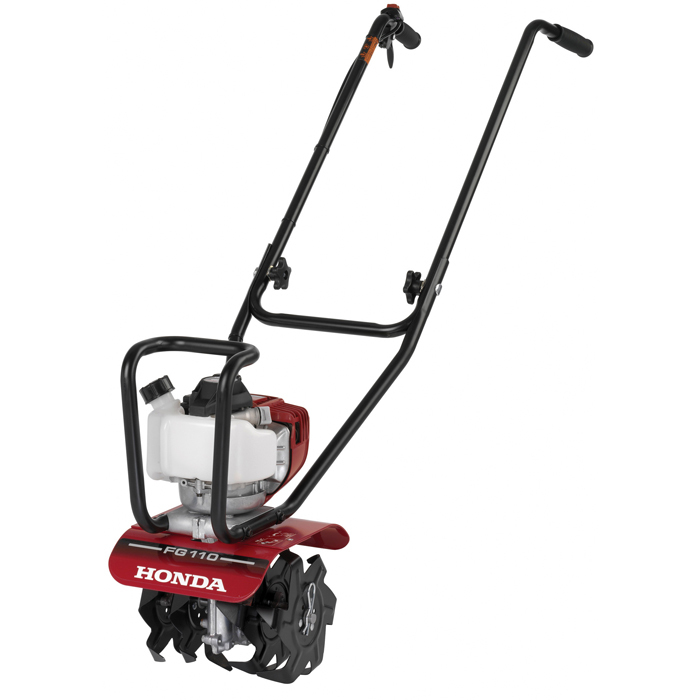 You can reduce this effort with the Honda’s FG110: a powerful micro-tiller designed specifically for use in smaller gardens. The Honda FG110 comes fitted as standard with four sturdy six-toothed hoeing tines, and provides a maximum working width of 23cm and a maximum tilling depth of 20cm. This allows great accuracy when working between narrow areas while the transmission features a worm gear drive which delivers consistently high torque. With a range of optional attachments available - including a de-thatcher, an aerator and a lawn edger - the FG110 is an extremely versatile tool. The FG110 is driven by Honda’s robust 25cc GX25T mini four-stroke engines, delivering long life with matchless reliability. The four-stroke power unit means that the FG110 is quieter and cleaner than a comparable two-stroke machine. A high capacity 0.57 litre fuel tank combined with the engine’s outstanding efficiency means more time between fuel stops. The Honda FG110 weighs only 13kg, while rear transportation wheels and a centralised carry handle make it simple to move around. A folding handlebar facilitates storage. Low vibration - Low vibration for comfort over long periods of use. Hybrid tines - Exclusive Honda hybrid tines dig and cultivate at the same time. Efficient engine - Easy starting 25cc mini 4-stroke engine with excellect torque, fuel efficiency and incredibly quiet and clean operation. Worm gear transmission - Single speed worm gear provides more torque, for greater efficiency under heavy load. Lawncare kit available - Optional lawn aerator, edger and de-thatcher also available, or sold as a complete kit. Narrow tilling width - 230mm wide tines enable you to dig between rows of vegetables or around shrubs with ease. Easy use, easy storage - Lightweight and compact with folding handlebars, carry handle and transit wheels supplied as standard, for easy transport and storage.